Money box at the lowest price online. 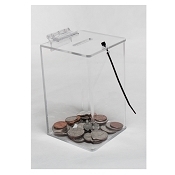 The coin and money collection box is injection molded from a virtually unbreakable plastic. 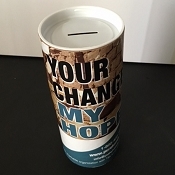 This is donation box is a small so you can place it next to a cash register on busy store counters and it will not take up too much space. 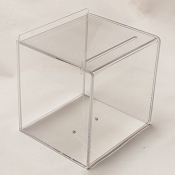 Header is made of clear acrylic plastic. 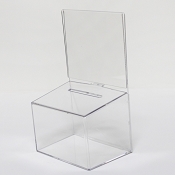 Clear acrylic has great clarity so your graphic shows cleanly without any distortion. This Box Is The Same As Our 210C But With A taller Header display sign. We made this box with the two different header display options so you have the choice. Some locations will request a very small donation box presence and other locations will allow a little larger presence. 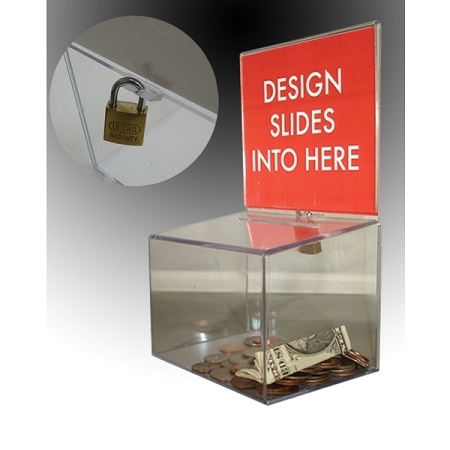 This box features our unique custom designed locking system so you can use a zip tie to lock it or use the included mini padlock. For International, AK, HI orders: Please note, shipping cost may not be accurate when ordering online. For an accurate shipping cost, please email us (info@leadbox.com) item(s ) and quantity you are interested in purchasing. Please include country.